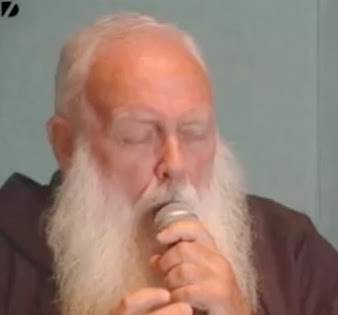 I’ve been thinking about Brother Cesare Bonizzi, the heavy metal monk, since yesterday’s blog post. Yesterday’s post was titled ‘Mentoring’ for a reason. There’s a laundry list of things I’d like to learn from him. He’s fearless. Oh, I’m sure he has some fear. But how much fear can a 62 year old monk who performs heavy metal music ON STAGE have? He’s ageless. In our culture, most 62 year olds have bought the recliner that they intend to die in. Not only is Cesare listening to a genre of music that is almost exclusively enjoyed by youth… he’s SINGING it! He’s in integrity. Cesare’s work as a brother and his passion for metal seem to be in integrity. Here’s a type of music that is often judged to be evil, and he’s incorporating it into his life and work, making it holy. I want to be just like Brother Cesare when I grow up!